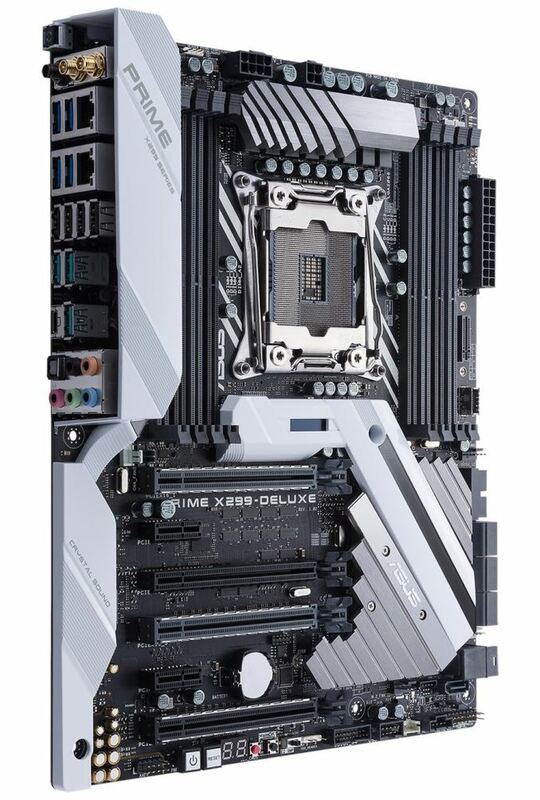 Sitting at the top of ASUS' consumer-focused motherboard line for X299 is the ASUS Prime X299-Deluxe. In the past, ASUS' 'Deluxe' line-up has attempted to emulate the status of the Mercedes S-Class but in motherboard form: showcasing new technology that may eventually filter down into where the bulk of the market sits over the next 3-5 years. The newest X299-Deluxe thus comes with a few of those technological features, such as WiGig and an informational OLED display, but also comes with onboard U.2 and a bundled Thunderbolt 3 add-in card. The Prime X299-Deluxe is the most expensive X299 motherboard we have tested to date. The ASUS Prime motherboard line started a couple generations back as a new way for ASUS to rebrand its mainstream consumer product line. The Prime X299-Deluxe we are looking at here happens to be the flagship in the 'consumer' X299 lineup, separate to the Republic of Gamers brand which focuses more on gaming functionality. The idea is that the non-gaming line has fewer of the gaming focused features, and might exhibit other appropriate features that a mainstream consumer is interested in. Along with the Deluxe, ASUS also offers a more cost-effective Prime X299-A, which trades off a few features in an effort to lower the price. The Deluxe however, aims to be at the top of this particular segment. Overall, the default performance of the ASUS Prime X299-Deluxe was average to slightly above average in most of our testing. We kept acceleration options at default, such as multi-core enhancement (MCE), to get the out-of-the-box performance. ASUS has an interesting approach to MCE now, offering the option to enable it when turning on XMP. In our tests, the ASUS Prime X299-Deluxe boosted the CPU to 3.6 GHz through testing, with the results tied to how the board may ramp up and down the frequency in our testing environment at the time. For system tests, the POST times were on the same scale as other board tested, as well as load power. Power use on idle was notably higher than other systems for an unknown reason we were unable to determine, however DPC Latency was in the top half of all the X299 boards we have tested. Our overclocking results hit 4.6 GHz with our new 7900X CPU, which is 100 MHz higher than the previous CPU but 100 MHz lower than the other board we tested on this CPU. As with other Skylake-X testing, CPU temperature issues are the common cause of our overclocking limit. The Prime X299-Deluxe, as a premium X299 motherboard, has a full consortium of storage options. Unlike most other X299 motherboards, it comes with a U.2 port for specialist NVMe drives. There is also seven SATA ports available on the board, with an eighth available through a combination SATA/PCIe M.2 port found under the heatsink. A second M.2 is a vertical M.2 slot on the right side of the board, which supports only PCIe devices, but also shares all of the bandwidth with the U.2 port meaning only one of the two can be used at the same time. The Prime X299-Deluxe offers users up to 3-way SLI and Crossfire support, dual Intel network ports, 802.11ac as well as WiGig Wi-Fi, the ASUS tweaked Realtek ALC S1220A audio codec, a U.2 port, and the unique white shrouding and RGB implementation among other features. For connectivity the back panel has ASMedia controlled USB 3.1 Type-A and Type-C ports, as well as chipset controlled USB 3.0 and USB 2.0 ports. Also on the back is a BIOS Flashback button, the audio stack, and the 802.11ac+802.11ad antenna mount points. The ASUS Prime X299-Deluxe is currently priced at $475 at Amazon. This price point puts the board at the high-end of the spectrum competing with boards like the GIGABYTE X299 Designare EX at $450 or the MSI X299 XPower Gaming AC at $440. ASUS has at least eight X299 boards to choose from, with different segmentation. The Halo product line is the Republic of Gamers boards, aimed at enthusiasts, overclockers and gamers: the ASUS ROG Rampage VI Extreme sits at the top, with the ROG Rampage VI Apex as the lower cost 'Rampage' option, followed by the ROG Strix X299-XE Gaming and Strix X299-E Gaming. 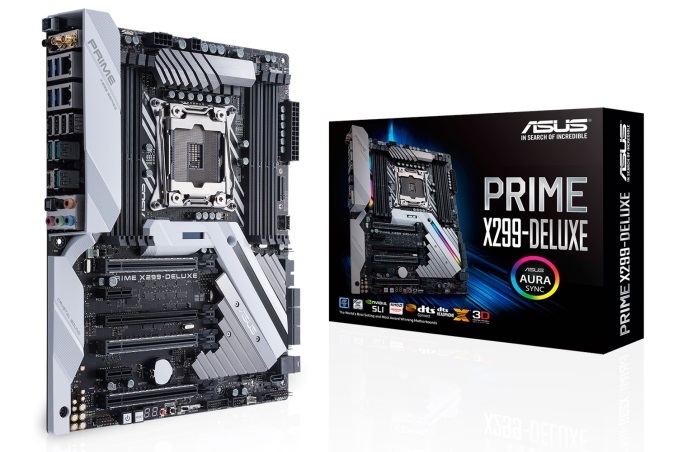 The Prime segment consists of two boards, with the Prime X299-A being more entry and the Prime X299-Deluxe fitting a high-end solution. The TUF lineup also consists of two boards, the TUF X299 Mark 2, and TUF X299 Mark 1. I generally agree (as an owner of an X99 Deluxe II), but at least one can sell all of the doodads, bells, and whistles on eBay leaving you with just a solid board. Do those add-ins even work? I bought the ThunerboltEX3 for a board it didn't come bundled with (but listed compatibility with it as a selling point), and it took me a few hours of trying different bios settings and driver version combinations to get it to even install properly within Windows, and still came up against a wall where it broke hibernate and hybrid sleep support in Windows.